It’s not a secret that the customer purchasing model is non-linear. Even if you are a home furnishings retailer that converts most of your revenue in your physical stores, your website plays a critical role in driving store traffic. Many furniture retailers may shy away from eCommerce because they don’t believe they can successfully convert sales online. However, there is greater conversion power in the digital Shopping Cart than meets the eye. So how can you make the checkout process on your furniture eCommerce website as convenient as possible to drive your conversion rate higher? Make the Path to Purchase Simple: Make sure the steps in your shopping cart checkout process are distinct and add value. If a step is unnecessary to ask of a consumer, eliminate it. Have people throughout your organization do user experience (UX) testing to get feedback on your checkout workflow. Use Auto-Fill: Auto-fill information for return customers or based on browser settings to make completing an order efficiently. Consumers will appreciate that you value their time. Define Pricing Clearly: During each step of your checkout process, ensure the customer knows what the final price of their purchase will be including all taxes, fees, and delivery information. You break trust when the last step indicates a higher than anticipated price, which can lead to shopping cart abandonment. Send Confirmations: Sending your customers a confirmation email regarding their purchase details is another best business practice. Communicate regularly on when an item is getting ready for delivery and other key milestones leading up to fulfillment. Now on to using shopping carts, in a less obvious, but equally valuable way. 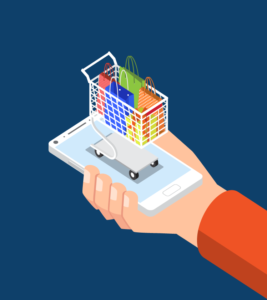 A digital shopping cart doesn’t have to be completed online to be considered a success. They can facilitate revenue generation by driving qualified traffic to your showrooms. Customers have a habit of adding items they are browsing into a cart and then narrowing down their options. Make it clear that the customer can see their selected items in their local showroom. This is especially valuable for products that carry a high ticket or have customizable options. If your furniture eCommerce shopping cart is integrated into your in-store POS solution, your sales associates can easily view your customer’s research history via their cart. They can adjust the customer’s order and seamlessly complete the cart in-store. This expedites the in-store checkout process. Further, if the customer wants to go home and sleep on their decision, they can access the same cart that was updated in-store and complete it from the comfort of their home at their leisure. Making your shopping cart process transparent and seamless is a win for your business. 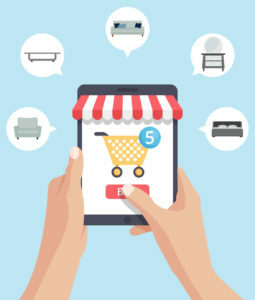 Perhaps enabling an eCommerce Shopping Cart on your website will provide more benefit to your home furnishings business than you had previously considered. Enjoyed this blog? Read more about Designing a Strong Home Furnishings eCommerce experience in our 12 Step Guide.